I've been practicing karate for about three and half years and it has hugely impacted my life. It's impacted me physically and mentally. Physically it's helped me become stronger and use my core strength a lot more, and mentally it has helped me be more open minded, open to more criticism and to concentrate more on the big picture. My understanding of karate was very shallow when I first started - I thought karate just involved kicks, punches, blocks and sparring. I didn't know anything about the philosophical side of karate; I didn't know that one even existed. Over the holidays, Shihan invited me to train at his own dojo. I felt really excited and privileged because I was getting a one-on-one lesson the teacher. We spent an afternoon learning how to see chi and auras. I couldn't believe my eyes when I saw chi for the first time; I felt very proud to have been taught this skill. I love the mix up of how in one lesson we can do bunkai and sparring, and some lessons we won't even throw a punch or a kick; we will listen to Shihan talk instead. He would go into detail about his past experiences with his teachers, trips to Japan, and so on. Karate to me means being the best that you can be, improve yourself, improve others, I feel that no matter how much you train, you will never be perfect, but perfection is what we all strive for. I remember when I was a white belt training at Westmeadows and Gladstone Park. There were usually a lot of senior students there; they all looked so good. I felt that the only way to get better was to train as much as I could and try my hardest to reach their standard so that I wouldn't be holding the class back. I believe that karate is a never ending story; you get one thing right but then you have to fix another thing. I feel self satisfaction when I am taught something and I can't get it right, but keep practicing it over and over, and eventually get somewhere with it; it's a good feeling. Our karate club is a very team based atmosphere everyone assists in helping everyone. I've been practicing karate for about three and half years and it has hugely impacted my life. It's impacted me physically and mentally. Physically it's helped me become stronger and use my core strength a lot more, and mentally it has helped me be more open minded, open to more criticism and to concentrate more on the big picture. Concentration was never one of my best skills but karate has helped me develop this. Karate has also impacted my attitude, my physique and my thinking; it's made me aware of DANGER! I believe that kata not only teaches you how to punch, block, kick, step etc., it teaches you how to be aware of danger out on the street which impacts your attitude and thinking, and therefore makes you a smarter person with great skills. To this day I have two stand out memories of my training experience with my karate peers. They are training with Shihan at his house when he taught me how to see chi and auras, and when Sensei Ishii came to visit from Japan for two weeks. Shihan once told me that karate is a journey. At the time, I had no idea what he was talking about, but as I progressed through the grades my understanding and knowledge of karate grew. I have started to understand what "the journey" means. My journey has only just begun. 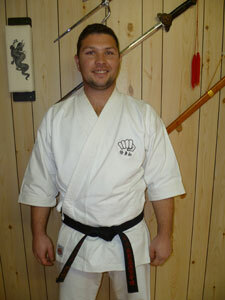 Adam Blanche began training Goju Ryu with Shushin Kai on 3rd June, 2008, at age 23 years. She was graded to Shodan on 8th October 2011.